This Grade II listed property, situated within the heart of the historic village of Cerne Abbas, offers an opportunity to acquire a sympathetically renovated property that enjoys an abundance of character and a wealth of original features. The property is set overlooking a communal courtyard and its own walled gardens. Cerne Abbas is situated in a valley surrounded by gentle hills typical of the West Dorset countryside. There is an extensive range of public footpaths and bridleways throughout the village and walks to suit every taste. The village is a bustling community of over 700 people, with a flourishing school, a rural Post Office, the village stores, a local tourist information point, three historic public houses, tearooms and a number of other shops to attract the visitor. Bed and Breakfast accommodation is also available. This period home has been renovated to the highest of standards, creating a wonderfully spacious character property. Entrance is gained via a communal courtyard, leading to a generous sitting room that features an attractive fireplace with log burner and a set of french doors that lead to the walled garden. The kitchen/diner enjoys a social and spacious feel and offers access to a walled patio courtyard. There are a comprehensive range of Shaker style fitted units with solid timber doors, quartz work surfaces and a wealth of integral Neff appliances. The property benefits from a separate utility room. 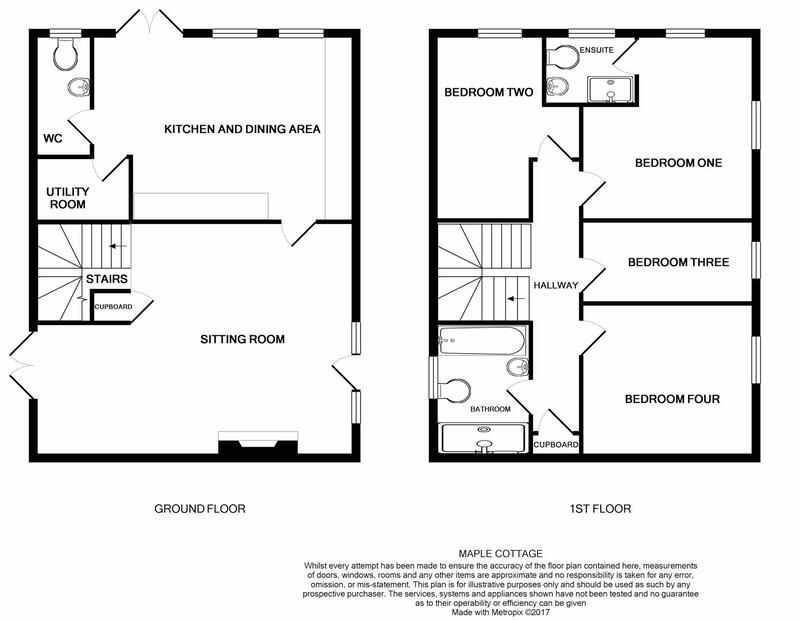 The quality of finish continues to the first floor where a spacious landing provides access to a tastefully fitted family bathroom and four generous bedrooms, the master enjoying en-suite facilities. Externally, the property boasts a courtyard patio to the rear that enjoys a southerly aspect. There is a further walled garden to the side of the property that is laid to lawn. The rear communal courtyard has been landscaped and offers areas of planting and features an original water pump that dates back to 1786. There is a gate that provides access to an area of secure, off road, allocated parking. Mains electricity, water and drainage are connected. Oil fired central heating. Broadband and satellite are available also.